When I was in high school, summer was a free-for-all, teenagers piling into vehicles as if we were clowns in a circus. And so it went. We squeezed in and somehow all of my friends made it to the destinations alive. Back then, we didn’t have cell phones. Distracted driving wasn’t a topic. But crashes still occurred. Teenagers were still killed. Many of those crashes had to do with two things: horsing around with our friends while driving, and driving without a seat belt. I am pretty sure I always wore my seat belt, because my dad drilled that into my head. When he was 16, he was a passenger in a car and was unbelted; in a high-speed crash he was ejected from the car, severely injured his leg, and lost his right arm as a result. I took the seat belt thing seriously. However, I can’t say that I took the rest as seriously. I ate while driving, fiddled with the radio, picked up dropped things on the floor, and cranked my Guns N’ Roses cassette as loud as my after-market stereo would allow. Later, when I was six months pregnant with my son, I was rear-ended by a teenager in a parking lot. As I leaped from the car, fire in my eyes, I said loudly to the other driver “Didn’t you hear me beeping at you? Was your radio up too loud?” and she sheepishly and quietly said yes. In 2016, Chevrolet offered new technology called Teen Driver in their Malibu sedan, which gives parents several options to prevent these scenarios. Today, the technology is standard (and can be disabled with a PIN if you don’t have kids) on most of its models, from the petite Cruze to the sizable Silverado. Teen Driver is designed with teens in mind, says Chevrolet Safety Engineer MaryAnn Bebee. 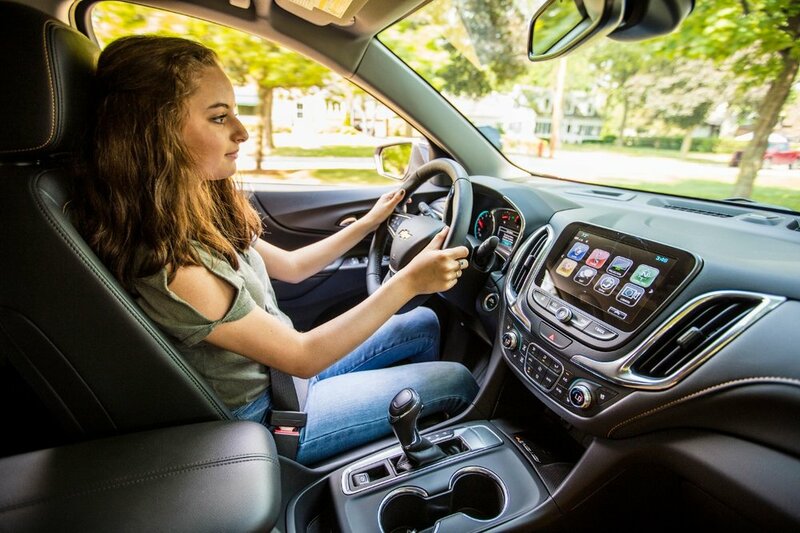 According to the Chevrolet web site, Chevrolet is the only car company to offer Teen Driver technology with an industry-first in-vehicle report on most of its models. The most recent study from AAA’s Foundation for Traffic Safety found that for every mile on the road, drivers ages 16-17 years old are nearly four times as likely as drivers 18 and older to be involved in a crash. They’re 2.6 times as likely as drivers 18 and older to be involved in a fatal crash. There’s a reason some states offer graduated driving licensing for teens; GDL is recommended by the Centers for Disease Control and Prevention (CDC) to prevent teen deaths on the roads. A GDL program starts new drivers with limitations that are lifted with time and experience – for instance, nighttime and passenger restrictions. Chevrolet's Teen Driver technology takes this to the next level, offering features like muting the audio until front seat occupants are buckled to automatically turning on available advanced safety technologies like Side Blind Zone Alert, Forward Collision Alert, and Forward Automatic Braking. I love to drive fast... on a track. But when I was a teenager, I remember very well the times that I pushed the speed to the limit, even burying the speedometer past 85 when I was driving my mom's old sedan home from college. The in-vehicle report card helps parents identify problem areas and coach new drivers on improvements. Teen Driver gives parents the tools to discuss and correct some of the possible mistakes their new drivers make on the road. To set up a report card, parents enter a PIN to access the Teen Driver menu through the display and register the key fob. When the teen is using that key fob while driving that vehicle, Teen Driver enables the features of the report card. One of those features that would have made a difference to me both as a teen driver and as a recipient of a crushed rear fender while pregnant is the Audio Limit function as well as the Seat Belt Audio Limit, which disables the audio until both passengers in the front are belted. "Over half of teenage fatalities are unbelted," says Bebee. "Teen Driver helps to remind them to practice safe driving." As parents, often we don't even realize the bad habits we are modeling for our kids. The report card is a way for parents to open discussions about the habits their teens are developing and correct them while they are still learning. I'm a smarter driver as an adult, but I know that I've been lucky many times. When my son is a teenager, there is no doubt in my mind that I'll sign him up for extra driving courses and will look for this kind of technology to ensure that he's treating the car - and his life - with the respect it deserves.